Published under her professional name of Valerie Taylor-Bouladon, Conference interpreting is a comprehensive overview with something to offer all interpreters - experienced, beginner or would-be. 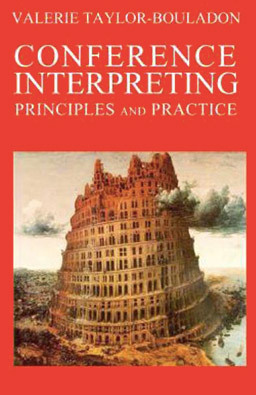 It begins with the history of interpreting in Europe and Australia, then looks at how it is done today, and what lies ahead. The interpreting profession is fairly unknown in Australia today and even government departments, faced with organising an international conference, are often unfamiliar with simultaneous interpretation, how it works, how it should be organised and where to find interpreters. The different modes of interpretation and the problems with using relay are explained. There is advice for language students, telling them where and how to train and tips for beginners, such as how to overcome stagefright, what to do if you miss something, and booth behaviour and microphone manners. You will learn how to become a graceful scapegoat, how to economise your voice, how to make delegates laugh when necessary and how to deal with Australianisms. There is information for conference organisers, explaining the necessity of having competent professional interpreters, and for Australian government ministers relying on interpreters from other countries when travelling overseas. An entire chapter is devoted to protocol and etiquette for interpreters working with government ministers when they are visiting or receiving overseas colleagues. The author also discusses interpreting for after-dinner speeches and press conferences, and at the dining-table, as well as etiquette, table manners and appropriate gifts in various countries. Interpreters' duties, responsibilities and ethics are dealt with, how to improve one's performance and maintain one's health, and whether or not you should be working into your B language. Interpreting for television and radio is covered, and there is a special and very important section on court interpreting, which discusses the gravity, complexity, special requirements and great rewards of this kind of work. This chapter was requested by court interpreters and also by Australian judges with whom the author was in constant contact throughout the writing of this book. There is a chapter about the bodies that make up the UN and EU, the languages they use and how to approach them for work. Details are given about the various national and international professional organisations for interpreters. Finally, the author discusses the future of language, including the impact of television and computers. Special committees have been set up a UNESCO in Paris and also at the Council of Europe, Strasbourg (which piloted a new European Language Portfolio in honour of 2001, the Year of European Languages), studying the future of languages such as Italian, German and Dutch which it is felt are likely to be the first to gradually fade into a sort of dialect unless something is done to prevent this happening. The governments of the countries concerned are investing considerable sums in research on this subject. There is also a comprehensive bibliography, with suggestions for further reading. Conference Interpreting is not intended to take the place of a training course, but rather to be an adjunct to assist the beginner interpreter who has just completed a course and knows all the theory, but is lacking in experience. It will also serve to inform experienced interpreters, community interpreters and conference interpreters about this vital, exciting profession. Those who have read the book say it is a 'good read'; the author has tried to make it entertaining as well as informative and has included many anecdotes. 11. A word in the ear of the conference organiser: Is interpreting necessary?